Since its discovery in 2016, planetary scientists have been excited about TRAPPIST-1, a system where seven Earth-sized rocky planets orbit a cool star. 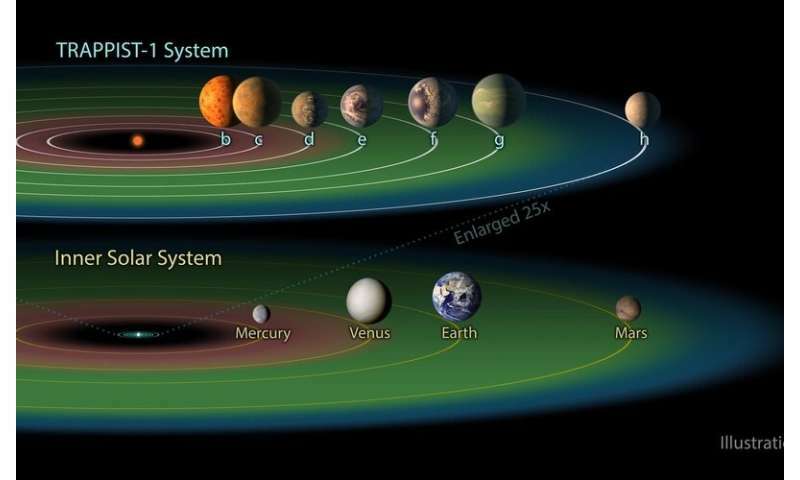 Three of the planets are in the habitable zone, the region of space where liquid water can flow on the planets' surfaces. But two new studies by scientists in the University of Arizona's Lunar and Planetary Laboratory may lead astronomers to redefine the habitable zone for TRAPPIST-1. Both Fraschetti's paper and Hay's study, "Tides between TRAPPIST-1 planets," are recently published in the Astrophysical Journal. The system's star, TRAPPIST-1A, is smaller, less massive and 6,000 degrees Fahrenheit cooler than our 10,000-degree sun. It is also extremely active, meaning it emits huge amounts of high-energy protons – the same particles that cause auroras on Earth. Fraschetti and his team simulated the journeys of these high-energy particles through the magnetic field of the star. They found that the fourth planet – the innermost of the worlds inside the TRAPPIST-1 habitable zone– may be experiencing a powerful bombardment of protons. "The flux of these particles in the TRAPPIST-1 system can be up to 1 million times more than the particles flux on Earth," Fraschetti said. This came as a surprise to the scientists, even though the planets are much closer to their star than Earth is to the sun. High-energy particles are carried through space along magnetic fields, and TRAPPIST-1A's magnetic field is tightly wound around the star. "You expect that the particles would get trapped in these tightly wrapped magnetic field lines, but if you introduce turbulence, they can escape, moving perpendicularly to the average stellar field," Fraschetti said. Flares on the surface of the star cause turbulence in the magnetic field, allowing the protons to sail away from the star. Where the particles go depends on how the star's magnetic field is angled away from its axis of rotation. 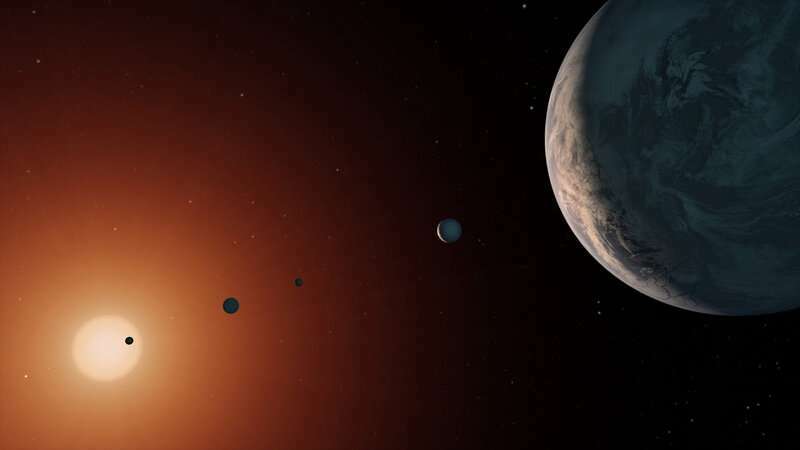 In the TRAPPIST-1 system, the most likely alignment of this field will bring energetic protons directly to the fourth planet's face, where they could break apart complex molecules that are needed to build life – or perhaps they could serve as catalysts for the creation of these molecules. While Earth's magnetic field protects most of the planet from energetic protons emitted by our sun, a field strong enough to deflect TRAPPIST-1's protons would need to be improbably strong – hundreds of times more powerful than Earth's. But this does not necessarily spell death for life in the TRAPPIST-1 system. "Maybe the night side is still warm enough for life, and it doesn't get bombarded by radiation," said Benjamin Rackham, a research associate with UA Department of Astronomy who was not involved with either study. On Earth, the moon raises tides not only in the oceans – tidal forces deform the spherical shape of Earth's mantle and crust, as well. 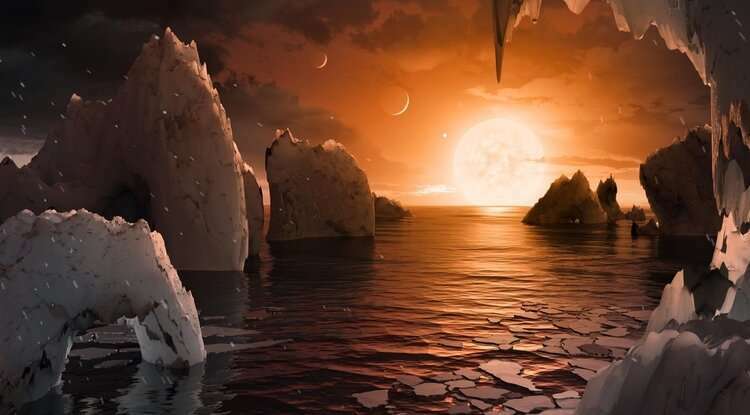 In the TRAPPIST-1 system, the planets are close enough together that scientists hypothesized the worlds might be raising tides on one another, as the moon does to Earth. "When a planet or moon deforms from tides, friction inside it will create heating," said Hay, lead author of the second study. By calculating how the gravity of TRAPPIST-1's planets would tug on and deform each other, Hay explored how much heat tides bring to the system. "It's such a unique process that no one's thought about in detail before, and it's kind of amazing that it's actually a thing that happens," Hay said. In the past, scientists had only considered tides raised by the star. Hay found that the inner two planets of the system come close enough together that they raise powerful tides on each other. It is possible the subsequent tidal heating may be strong enough to fuel volcanic activity, which can in turn sustain atmospheres. Though TRAPPIST-1's innermost planets are likely too hot on their day side to sustain life, a volcano-fueled atmosphere could help move some heat to their otherwise-too-cold night side, warming it enough to keep living things from freezing. M-dwarf star systems like TRAPPIST-1 offer astronomers the best opportunity to search for life outside the solar system, and Fraschetti and Hay's studies may help scientists choose how to explore the system in the future. "We need to really understand the suitability of these systems for life, and energetic particle fluxes and tidal heating are important factors to constrain our ability to do that," Rackham said. 1. Must be in habitable zone. 2. Planet must be tidally locked on its axis as is the case with Earth and the Moon. If the planet's poles are moving too much, there is insufficient stability for complex life. It basically means there's no seasons, anything (weather etc) can happen any day. necessary components, but never being able to bare fruit. 3. The planet must have a thick atmosphere, be geo-active and have water. All of this combines the various processes including lightning, stability, heat, erosion, oxidization, evolution of rocks and complex compounds. Now its possible that another liquid could substitute water to replace life carbon or non-carbon based, but you absolutely require a liquid.